Burger King made headlines yesterday when it began running a 15-second television ad made to intentionally activate Google Home speakers and Android phones within earshot. 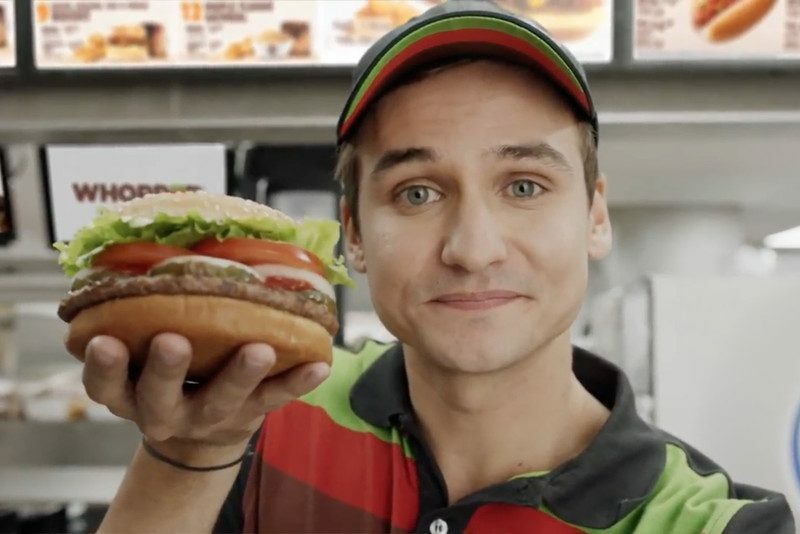 The simple commercial involves someone posing as a Burger King employee who leans into the camera to ask the question "OK Google, what is the Whopper burger?" – a request designed to prompt Google virtual assistants nearby to start reading the burger's Wikipedia entry. To the relief of many, Google quickly moved to prevent its Home speakers from responding to the ad by registering the sound clip and disabling the trigger. Voices on TV have been inadvertently triggering smart speakers for months now, but the ad represents the first attempt by a company to purposely hijack users' devices for commercial gain. One likely reason Burger King chose to target Google Home rather than iPhones is that unlike Apple's Siri, the virtual assistant cannot be trained to recognize a particular user's voice, which highlights one of the main issues with connected smart speakers currently on the market. As it stands, Google Home can only be used with a single Google account at a time, and lacks the ability to differentiate users by their voice patterns. Google has said its ultimate goal for Home is to be able to identify different people in the same room – and hints of multi-user functionality have briefly appeared in the Google Home app – suggesting some sort of voice identification feature is likely coming. Likewise, Amazon is known to be working on a similar system that would allow its Echo range of smart speakers to distinguish between individual users based on the sound of their voices. According to sources, Amazon's feature would work by matching the person speaking to a pre-recorded voice sample, or "voice print", to verify the speaker's identity. Currently, Echo users can set up multiple profiles and jump between them, but the user must say "switch accounts" or use the Alexa app to do so. Last May it was rumored that Apple will launch an Echo-like speaker with Siri integration, enabling users to play music, get news headlines, and more, without needing to interact with their iPhone. According to one source, Apple's speaker could process many typical iPhone Siri commands. For example, users may be able to ask the device to read e-mails, send text messages and tweets, and stream content from Apple Music. Apple is even said to have considered integrating map information into the speaker, allowing the device to notify a user when it's time to leave the house for an appointment. However, all of these capabilities would require Siri to know exactly who it is interacting with – a feat which, in a communal setting, could pose significant technical challenges for a company high on privacy. In this sense, the appearance of an Apple smart speaker may ride on Apple's ability to make user voice recognition as secure as biometric authentication features like Touch ID. On the other hand, Apple could bring in biometric features to augment the speaker's user identification system. Indeed, some of Apple's speaker prototypes in testing are said to include technology related to facial recognition, potentially aided by Apple's acquisition of Faceshift and Emotient, which may help the device act based on who is in a room or a person’s emotional state. How secure such systems would be in these scenarios remains unclear, however. According to rumors, Apple's smart speaker-esque device could release later this year. Pretty creative move. Too bad Google already stopped it. So the voice actor for the ad can no longer use the "Okay google" hotword on his google devices? Nice. Because 1 obnoxious form of advertising at a time isn't enough for corporations anymore, so they naturally come up with ways to use their ads to prompt other ads. Soon enough, modern life will simply be an Inception of advertising. We'll need to spin a top to figure out whether or not someone's trying to sell us something. When google get a request asking about the whooper it should respond with information about the big mac! I LIKE that my friends can use my Echos, so they can switch around the lighting, music etc. I'm the only one that knows the code to initiate the self-destruct sequence, so I'm not seeing the security issue here? There's a place for folks like you called Slashdot. I think it would be amazing if the iPhone in my hand was full of solenoids throwing relay switches all the time - with a beautiful blue glowing vacuum tube sticking out the top!!!!! The question is why are these companies releasing this kind of crap before the user experience can't be ruined by this kind of commercial (or frankly, ******* friends) trolling? For the same reason we have robotic vacuums, smartphones, fingerprint sensors, voice control remotes and a million other things before they are absolutely foolproof. Quite often, nobody can think of all the ways to break something until they actually happen. Then you fix it. Or ignore it, if the benefit outweighs the cost/risk. Such is life. Technology will progress where necessary and when affordable. From what I've read, it seems they blocked the specific sound clip on the server side. The OK Google trigger still fires, but no reply is returned. Depending on how focused their filters are, the voice actor should either not notice anything, or at worst he would be unable to ask Google Home for the composition of the Whopper burger.